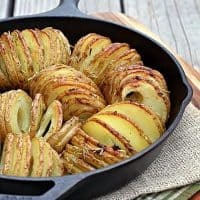 If you’ve ever tried making those Hasselback potatoes that are all the rage on Pinterest, you’ve learned how difficult it is. Cutting the potatoes into those perfectly even, thin slices (without actually cutting all the way through the potato) is a big pain. Well friends, I have a brilliant solution for you! We recently had dinner with our friends the Davidsons and they served some beautiful, delicious, perfectly thinly sliced potatoes. And they did it with their apple peeler, corer and slicer! If you don’t have one, they’re fairly inexpensive, and now that you know they’re for more than just apples, it’s definitely worth adding one to your collection of kitchen gadgets. I baked my potatoes in a cast iron skillet, but if you prefer, you can fan them out on a lightly greased baking sheet and cook them that way. They don’t have to stand up in the pan. I just liked the way it looked. Be sure when making these potatoes to adjust your slicer so it doesn’t peel them–unless you really don’t want the peel. And don’t throw out the potato core! Season it up with the rest of the potatoes and bake it too! Wash and dry potatoes. Using your apple peeler, corer and slicer, cut potatoes into spirals, leaving the peel on. Arrange potatoes in a 10-inch cast iron skillet or on a lightly greased baking sheet. In a small bowl, whisk together olive oil, rosemary and garlic. 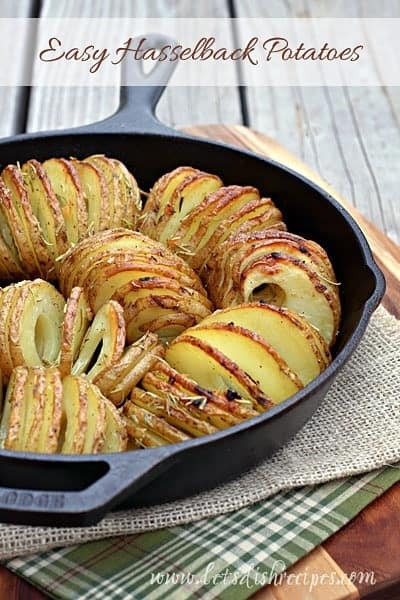 Brush olive oil mixture over potatoes, being sure to brush in between slices. Season potatoes generously with salt and pepper. Bake for 40-50 minutes, or until potatoes are golden brown and tender. These potatoes look wonderful & they are something different to serve as a side dish. Also, what a great idea using the apple peeler. This is how I made mine. Works like a dream. I put the core back in my potatoes. It made it easier to serve them. I would love them in the cast iron skillet. Can you use rusted potatoes instead of yukon gold potatoes?